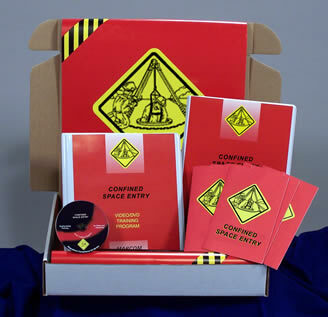 Description: MARCOM's "Confined Space Entry" Regulatory Compliance Kit™ addresses the major areas of employee training required by the regulation. This Kit was created specifically for OSHA's Permit Required Confined Space Regulation (29 CFR Part 1910.146). Because of OSHA's broad definition of "Confined Space", this Kit will be useful to a number of different types of facilities, including manufacturers, utilities, petroleum and chemical industries, hospitals and many others. Materials in the Kit include a Videotape Program, a Compliance Manual, five motivational Posters, and 30 Employee Booklets. A Compliance Manual containing a "fill-in-the-blank" Permit Entry Program, as well as other materials needed to help meet compliance requirements, is included. The Posters in the Kit emphasize the importance of using appropriate Lock-Out/Tag-Out equipment. The Videotape and Employee Booklets include information on contents of the standard, responsibilities of the employer, entry supervisors, attendants and entrants, identifying permit spaces, types of hazards that can be encountered, safety equipment, dealing with emergencies and rescue teams, and more. The Videotape Program in the Kit comes with a comprehensive Leader's Guide, reproducible Scheduling & Attendance Form, Employee Quiz, Training Certificate and Training Log.